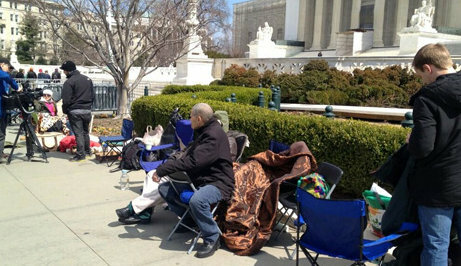 Line Forms Outside Supreme Court - Joe.My.God. Via Andy Towle: “A line has already begun forming at the Supreme Court to hear arguments on Proposition 8 and DOMA which are next week on Tuesday and Wednesday. The line apparently began forming yesterday.” Reportedly this is the earliest a line has ever formed to hear a Supreme Court case, including for Obamacare. UPDATE: JMG reader John tips us that a friend of his is blogging from his place in the line.